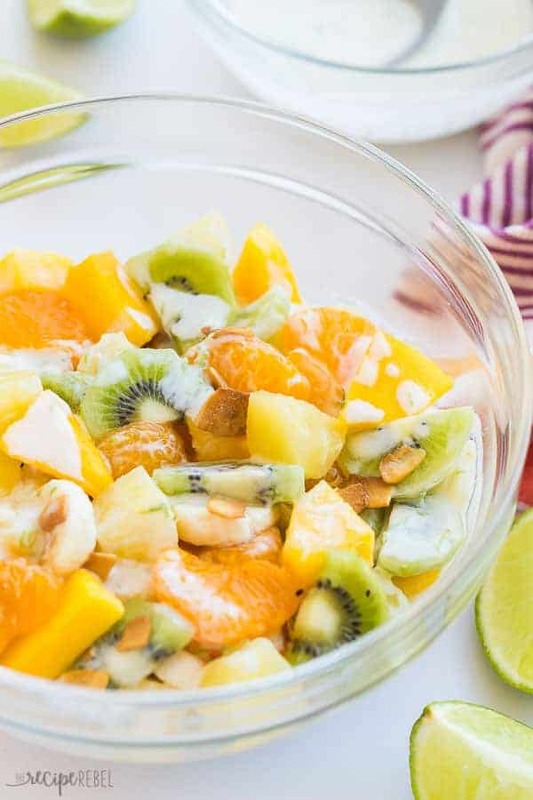 This Hawaiian Fruit Salad recipe is full of tropical flavors and a honey lime yogurt dressing with hints of coconut! Loaded with pineapple, bananas, mango, oranges and kiwi, it’s the perfect side or dessert for any summer meal! Last Spring I shared this Creamy Fruit Salad with Homemade Vanilla Dressing, and I loaded it up with all my favorite fruit and a creamy custard fruit salad dressing. If you’ve ever had a Mountain of Fruit Waffle at Cora’s, this is like that, minus the waffle 😉 They do make some pretty incredible waffles, and the combo is ridiculously good. If you ever have leftover fruit salad, I bet it would make an awesome waffle topping for brunch the next morning. 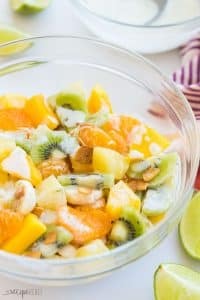 This time, I wanted to stick closer to a theme with my fruit (sometimes when you get too many different kinds all in one bowl flavors get a little muddled), and I love the fresh, tropical flavors in this Hawaiian Fruit Salad. Because I love pineapple in everything, as I hope you do, too! If you’re looking for some savory pineapple recipes, check out these Hawaiian Chicken Burgers, Hawaiian Ham and Pineapple Skewers or this Hawaiian Chicken from my friend Holly. It would be hard for me to choose a favorite! This fruit salad recipe is naturally gluten-free, but double check all of your packages to be sure. 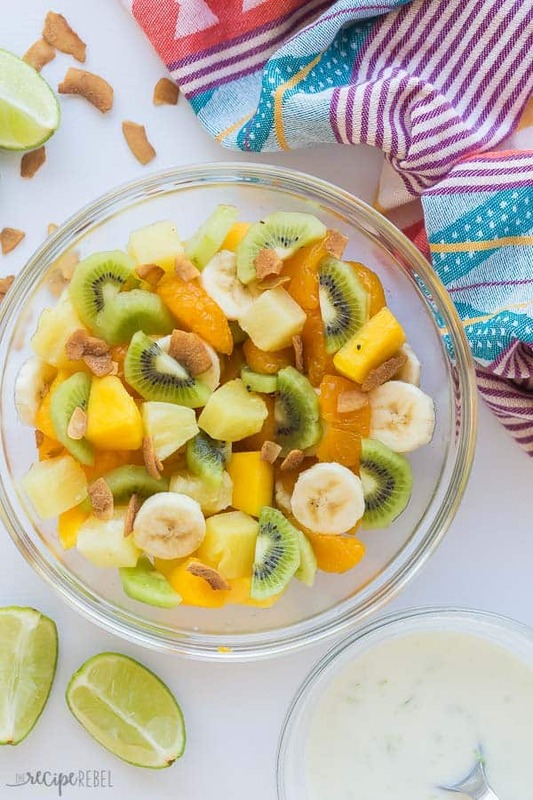 This Hawaiian fruit salad recipe can easily be made dairy-free by swapping out the regular yogurt for your favorite variety of dairy-free yogurt. Feel free to mix up the fruit you use for this salad — almost any fruit will go well with this dressing! I chose fruit that I think is most “Hawaiian” (not that I am Hawaiian or know anything about Hawaiian culture). For this fruit salad recipe, I used a Honey Lime Yogurt dressing with added coconut extract. You can definitely mix this up, and use flavored yogurt, or different extracts, or skip the yogurt altogether and make more of a glaze. The important thing to note is that thick creamy fruit salad dressing recipes don’t sit well when combined with the fruit. The juices that are released from the fruit water down the dressing and make it thin and not very appealing. Fruit salad is best made just an hour or two before you’re going to serve it — there’s really no way around that! Chop the pineapple, the mangoes, the kiwi, and drain your mandarin oranges. Store in separate, small containers in the refrigerator. Store up to 2 days in advance. Stir together your dressing ingredients, and refrigerate up to 2 days in advance. Slice your bananas, and stir everything together just before serving. Watch the recipe video and see how easy this fruit salad recipe is to make! 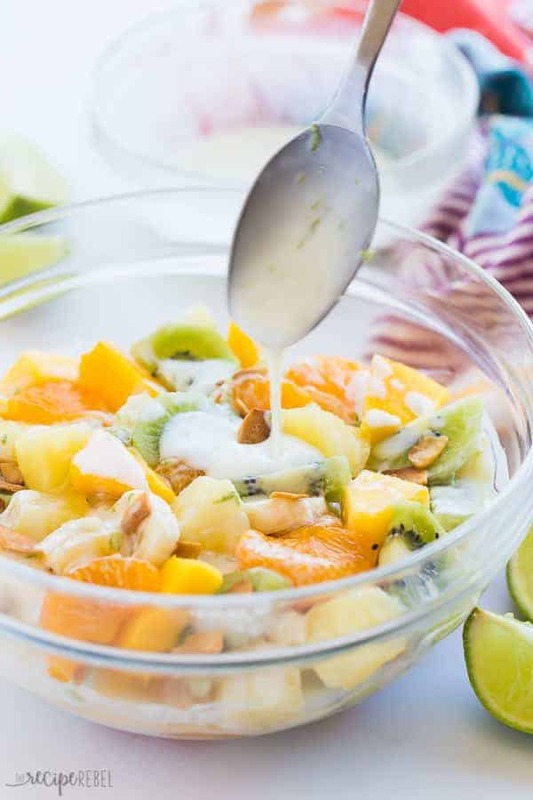 This Hawaiian Fruit Salad recipe is full of tropical flavors and a honey lime yogurt dressing with hints of coconut! Loaded with pineapple, bananas, mango, oranges and kiwi, it's the perfect side or dessert for any summer meal! Add all fruit to a large bowl. In a small bowl, whisk together yogurt, honey, pineapple juice, coconut extract and lime zest if desired. Start small with the extract and lime zest, and add and adjust as needed to suit your tastes. Drizzle over fruit in bowl, and stir gently to combine. Refrigerate for 1-2 hours or serve immediately (it will be best if the fruit and dressing is chilled). This is absolutely perfect for summer! I love a good fruit salad on a hot day. And pineapple is totally one of my favorite fruits. Love this!